While the weekend’s wintry weather made it difficult for the road runners it didn’t deter the trail racers from a full race programme. The fourth instalment of the Sperrin Harriers Winter League Trail Series took place in Cookstown, while the seventh race in the ‘Run Forest Run’ Trail Series, hosted by events management company, Born 2 Run, was in the grounds of Antrim Castle. Once again it was the talented Eoin Hughes (Acorns AC) who led from start to finish winning his third event of the series in a time of 36.33. Seamus Bradley (unattached) pushed Eoin all the way but was unable to catch him and finished second in 37.31. Jason Wilson (Ballymena Runners) completed the podium in 37.41. The ladies race was once again dominated by Gillian Wasson (Ballymena Runners) winning in a time of 44.21 to make it four wins out of four in the series. Olivia Mullin (Greencastle AC) finished second in 44.59 and Jo Bradley (unattached) was third in 47.25. 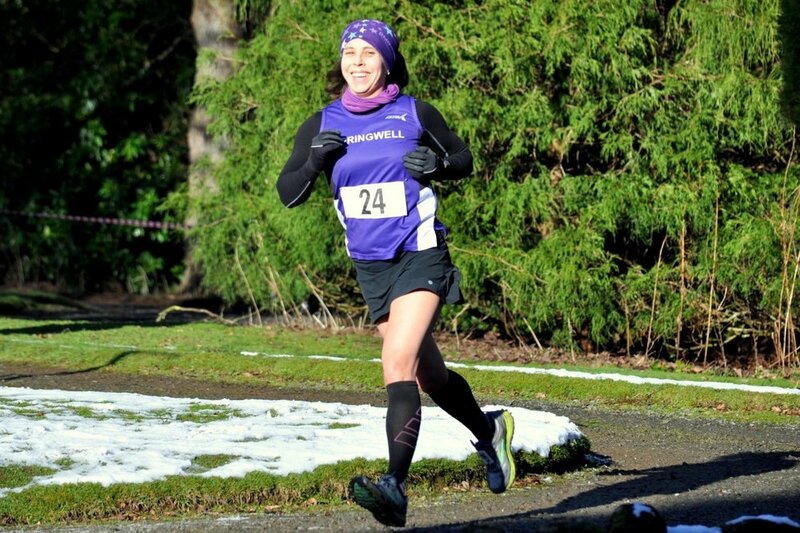 Karen McLaughlin was the first of the Springwell RC finishers as fourth lady (37th overall) in a time of 47.40. 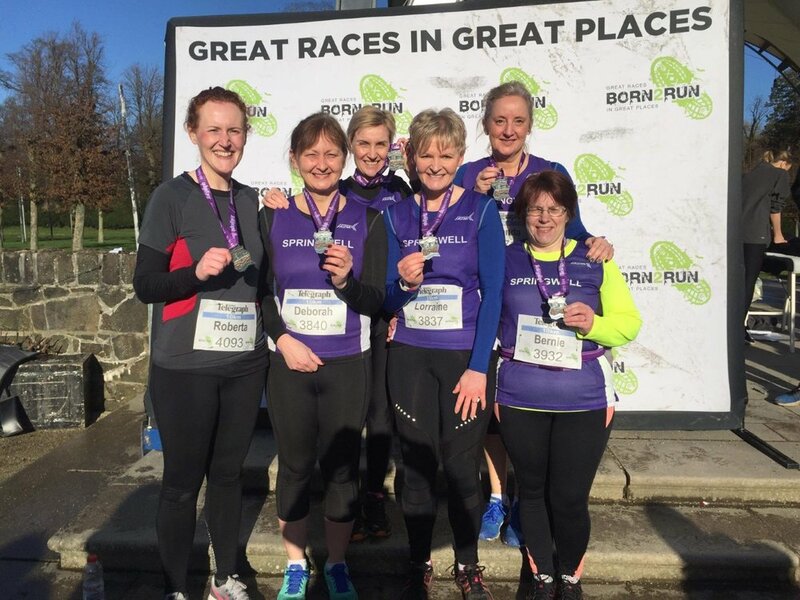 The other Springwell RC finishers were 82nd Sarah Dickinson 53.45, 85th Carolyn Crawford 53.58, 89th Majella McAteer 53.58, 108th Paul Dornan 57.35, 113th Mariette Mulvenna 1.00.23. Almost 1000 runners took part in Saturday’s ‘Run Forest Run’ event at Antrim Castle Gardens. The frosty weather resulted in some last minute gritting to ensure there was sufficient grip and, once completed the races took place in bright sunshine. Roberta McKenzie, Deborah Archibald, Nicola Stewart, Lorraine Abernethy, Amanda Scott and Bernie Drain. Starting in Trafalgar Square and finishing in Whitehall, adjacent to Downing Street, the Cancer Research UK Winter Run takes in many of London’s iconic landmarks. On Sunday 3rd February over 11,500 competitors took part in this fundraising 10k which also allowed the runners to experience ‘Snow Blasts’, a ‘Penguin Party’ and ‘Polar Bear Hugs’. The first four Winter Runs have already raised over £2,000,000 for Cancer Research UK and among this year’s fundraisers was Springwell RC’s Roisin Walker, taking part in her latest fundraising event with a personal best time of 56.18. Roisin now has 12 weeks to prepare for her next fundraising event which will be the Virgin London Marathon.